Dupuytren’s disease (DD) is a fibroproliferative disease of the palm of the hand. Here, we present a protocol to culture resection specimens from DD in a three-dimensional (3D) culture system. Such short-term culture system allows preservation of the 3D structure and molecular properties of the fibrotic tissue. Karkampouna, S., Kloen, P., Obdeijn, M. C., Riester, S. M., van Wijnen, A. J., Kruithof-de Julio, M. Human Dupuytren's Ex Vivo Culture for the Study of Myofibroblasts and Extracellular Matrix Interactions. J. Vis. Exp. (98), e52534, doi:10.3791/52534 (2015). Organ fibrosis or “scarring” is known to account for a high death toll due to the extensive amount of disorders and organs affected (from cirrhosis to cardiovascular diseases). There is no effective treatment and the in vitro tools available do not mimic the in vivo situation rendering the progress of the out of control wound healing process still enigmatic. To date, 2D and 3D cultures of fibroblasts derived from DD patients are the main experimental models available. Primary cell cultures have many limitations; the fibroblasts derived from DD are altered by the culture conditions, lack cellular context and interactions, which are crucial for the development of fibrosis and weakly represent the derived tissue. Real-time PCR analysis of fibroblasts derived from control and DD samples show that little difference is detectable. 3D cultures of fibroblasts include addition of extracellular matrix that alters the native conditions of these cells. As a way to characterize the fibrotic, proliferative properties of these resection specimens we have developed a 3D culture system, using intact human resections of the nodule part of the cord. The system is based on transwell plates with an attached nitrocellulose membrane that allows contact of the tissue with the medium but not with the plastic, thus, preventing the alteration of the tissue. No collagen gel or other extracellular matrix protein substrate is required. The tissue resection specimens maintain their viability and proliferative properties for 7 days. This is the first “organ” culture system that allows human resection specimens from DD patients to be grown ex vivo and functionally tested, recapitulating the in vivo situation. Dupuytren's disease (DD), a benign fibroproliferative disease causes permanent flexion of the fingers due to the formation of nodules and cords in the palm of the hand. Although the disease spread is particularly high among Caucasians of Northern Europe, the underlying genetic etiology of the disease remains unknown 1. The main characteristic of DD is the excess production of extracellular matrix (ECM) proteins (e.g., collagen), which form a tough fibrous tissue occupying the space between the tendons and skin of the palm of the hand and fingers, permanently disrupting the fine movements of the hand 2, 3. The recurrence of the disease suggests underlying genetic alterations as a cause of fibrosis 1, 4. An effective treatment could be to target directly the uncontrollable fibrotic mechanisms at the cellular and molecular level. Our recent work on fibrosis has led us to the development of a novel 3D culture system that allows short-term culture of human fibrotic tissue with the potential of drug testing. This system has helped to overcome the limiting approach of 2D fibroblast cultures and to define a role for the partial down regulation, achieved by exon skipping, of TGFβ pathway activation in mediating fibrosis 5. We have developed a method to culture ex vivo human resection specimens from DD patients to study the interaction between myofibroblasts and the surrounding ECM 5, 6. The study of DD connective tissue fibrosis as well as other fibrotic diseases relies on histopathological analysis of the excised surgical specimens, isolation of fibroblasts from the tissue and establishment of primary cultures or cell sorting procedures. These approaches are quite static since they do not permit exogenous manipulation of the disease properties or therapeutic intervention by the experimenter. In addition, primary cell cultures tend to adapt to the culture conditions and their gene expression properties differ essentially from the in vivo situation upon every passage, even during early passages (among passage 3 and 6) 7, 8. We have managed to maintain the waste surgical material in ex vivo culture conditions for a time period that allows study of the patient-specific characteristics and screening of anti-fibrotic or anti-inflammatory drug compounds. The system is based on a nitrocellulose membrane that permits contact of the tissue with the medium but not with the plastic, thus, preventing the alteration of the tissue upon attachment, as previously observed when culturing DD fibroblasts as well as other cell types 9. No collagen gel or other ECM protein substrate is required, since the DD tissue itself produces large amounts of these proteins. This is advantageous for the maintenance of native ECM microenvironment and turnover since matrix substrates are important regulator of tissue architecture and function 10, 11. For instance, ECM proteins such as fibronectin, laminin and collagen, may influence front-rear polarity of fibroblasts as similarly shown for apical-basal polarity in epithelial cells 12, 13. Polarized cells have asymmetrical distribution of extracellular molecules which determines cell migration and gene expression, e.g., α1β1 integrin accessibility on the membrane affects cell adhesion to type I collagen14. Since a primary goal of this 3D model was to preserve the native microenvironment, no artificial ECM matrix substrate was used. In brief: resection specimens are equally cut in a sterile environment and placed on nitrocellular membranes. If treatment administrated via injection is required the tissues are injected after they have been placed on the membrane. If treatment does not require to be administrated via injection then the compound is added to the culture media (Dulbecco’s Modified Eagle’s Medium (DMEM), with 1% fetal calf serum (FCS), 1% penicillin-streptomycin (P/S)). The cultures are maintained for a maximum of ten days after which the tissue is fixed in 4% paraformaldehyde (PFA), processed through 30% sucrose solution, embedded in O.C.T. compound and stored at -80 °C, as previously described 5. This protocol follows the LUMC and AMC guidelines of human research ethics committee. Note: Although various techniques for surgical excision of Dupuytren’s contracture exist, the current gold standard is the partial fasciectomy 15. Most patients are treated in the day-surgery clinic. Perform surgery under general or regional anesthesia according to patient's and anaesthesiologist's preferences and to patient’s co-morbidities. These considerations are beyond the scope of this paper. Prior to incision, touch the skin with a sharp object to verify that anesthesia is satisfactory. Use a tourniquet to facilitate surgical visualization in a bloodless field. After sterile prepping and draping, mark out the anticipated incision with a pen. Incise the skin with a scalpel under loupe magnification either longitudinally or using zigzag incisions to prevent additional contractures and also to allow for sufficient exposure. Using scissor dissection, free the skin and subcutaneous layer from the underlying contracted fascia palmaris. Identify and protect the neurovascular bundle of the finger because the diseased cord can displace it toward the midline. Once the fibrotic tissue (nodule and/or cord) is outlined, excise it sharply and regionally (subtotal) using a scalpel. Perform meticulous hemostasis under tourniquet control at the end of the procedure to prevent hematoma formation. To close the skin, use additional Z-plasties to obtain partial lengthening of the skin. For these studies use only the nodule part of the fibrotic cord, the most active and cellular part of the disease. Have the surgeon perform macroscopic identification. The isolated nodules in the palm of the hand are often precursors or a cord but are hardly ever resected, as they usually do not cause symptoms. The ones we resected were the nodules that were part of a cord of the contracted finger. Identify these nodules by the hard thick part of the cords in the handpalm (Figure 1A). Once the surgeon removes the tissue, immediately transfer it using sterile forceps to a 50 ml tube containing DMEM medium supplemented with 10% FCS and 1% (P/S). Keep the tissue for a maximum of 2 hr in this medium on a box of wet ice (4 °C) (e.g., transportation of the tissue from the operation room to the cell culture facility). Keep the samples on wet ice (4 °C) while preparing for the next step. Preparation of the materials and cell culture chamber requires 10-20 min. Note: All procedures are performed at RT unless specifically stated. Prepare 500 ml of DMEM supplemented with 10% FCS and 1% (P/S) and filter sterilize. Prewarm the medium at 37 °C. Autoclave forceps, a pair of curved-bladed Mayo scissors (150-170 mm in length) and a pair of Metzenbaum scissors and store in a sterile container. Under laminar flow, open a sterile 12-well culture plate. Place one culture insert (0.45 µm pore size, 12 mm diameter) in each well of the 12-well plate (Figure 1B, lower panel). Fill the 12-well plate with 600 µl of prewarmed (37 °C) culture media by pipetting on the well and not directly on the membrane of the insert. Place the plate into the incubator (37 °C, 5% CO2) (Figure 1B, upper panel). Alternatively, use a 24-well plate and add 300 µl of medium per well. The volume of medium per well is optimal when a meniscus layer is formed between the liquid and the lower part of the membrane insert. Note: the medium at the bottom of the well diffuses through the nitrocellulose membrane forming the meniscus layer as depicted in schemes of Figure 1B (lower panel). Transfer the nodule part of the cord from the 50 ml tube on a 100 mm Petri dish and add 10 ml of prewarmed (37 °C) medium. Ensure that the tissue is in contact with the liquid during the entire procedure. Remove the perinodular fat layer using the Metzenbaum scissors. Discard the fat tissue. With the use of forceps and the curved-bladed scissors, cut transversally the tissue into smaller pieces (maximum thickness of 200 µm). Transfer the 12-well plate from the incubator into the laminar hood. Check that the membrane of the insert has turned transparent (wet) and therefore is in contact with the medium. Using forceps carefully lift a tissue part by touching the outer layer (do not apply tension on the tissue). Place one tissue part onto the membrane of the cell culture insert so that the tissue remains in the air-medium interphase. Culture a maximum of two tissue parts on the same insert/ well. 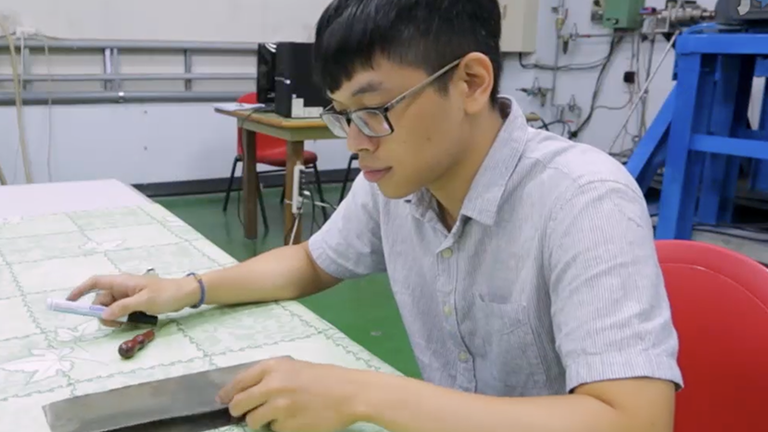 Ensure that the tissue is placed flat on the membrane, in longitudinal contact with the medium such that the tissue neither floats off the membrane nor is fully covered by medium. Avoid air bubbles. Note: At this stage, it is possible to add growth factors or inhibitors of interest to the media; for instance, test compounds (A, B, C, D, E) in replicates and/or in concentration curve. Include at least 2 control (untreated) pieces of tissue under normal growth conditions to ensure that the experiment has been set up properly. Incubate tissues for 3-7 days in a tissue culture incubator. Infect the tissue with either lentiviral or adenoviral construct if overexpression or knock down experiments of a gene-of-interest need to be performed (Figure 2). Transfer a tissue part from the 12-well plate into a 35 mm dish using forceps. Use a maximum volume of 10 µl of high titer virus. Perform the injection under a dissection microscope with an insulin syringe loaded with 50 µl PBS containing 10 µl of the selected virus. Place the needle perpendicular to the center of the tissue. Slowly inject the content of the syringe. Do not retract the needle directly. When puncturing the tissue, do not let the needle go through the other side but maintain the needle within the tissue itself (around the center of the tissue). Transfer the tissue back into the 12-well plate, close the culture plate and place it into the incubator (37 °C, 5% CO2). Note: All procedures are performed at RT unless specifically stated. The protocol for whole mount immunostaining and imaging described below is an adaptation from previously reported methods used for other tissues 16-19. Buffers and materials are described in Table 1 and Materials List. Transfer tissues from the culture plate to 2 ml microcentrifuge tubes containing PBS. Wash 2x for 5 min in PBS solution on a rotating platform. Fix tissues in 4% buffered PFA (1.5 ml solution per tissue in 2 ml microcentrifuge tubes), O/N at 4 °C on a rotating platform. Remove PFA and wash 3x in PBS for 5 min each. Dehydrate tissues by immersion in a 25% methanol solution for 2 hr at RT on a rotating platform. Increase the methanol percentage gradually (50%, 75%, 100%) with the tissues immersed at each solution for 2 hr at RT on a rotating platform. Transfer tissues in DMSO/methanol solution (permeabilization step) for 3 weeks at 4 °C, as described previously 18. Note: At this stage, tissues can be stored long term in 100% methanol at -20 °C. Proceed with staining procedure 16, 17; gradually rehydrate tissues (75%-50%-25%-0% methanol series). Perform each rehydration step for 2 hr at RT or O/N at 4 °C, under constant agitation. Incubate samples with primary antibodies in PBS containing 1% bovine serum albumin (BSA) and 20% DMSO O/N at 4 °C. Use antibodies at the following ratios using the commercial stocks in PBS: anti-α smooth muscle actin (1:500, mouse), anti-collagen type I (1:500, goat), anti-collagen type III (1:500, goat). Wash extensively in PBS for 48 hr at 4 °C (change PBS solution 3 to 4 times). Dilute appropriate secondary antibodies (Alexa 555 anti-mouse, Alexa 488 anti-goat) at 1:250 dilution in PBS containing 1% (BSA) and 20% DMSO. Incubate O/N at 4 °C. Wash extensively in PBS for 48 hr at 4 °C and incubate with nuclear counterstain, TO-PRO-3 diluted 1:500 in PBS at the final washing step. Note: TO-PRO-3 is a far-red emitting DNA dye (with a He-Ne 633 nm laser line) and is combined for simultaneous imaging with other channels; in this case collagen type I / collagen type III (488 nm), α smooth muscle actin (555 nm), TO-PRO-3 (647 nm). Transfer the tissues to a methanol series (25%-50%-75%) to slowly dehydrate the tissue; perform each dehydration step for 2 hr at RT or O/N at 4 °C under constant agitation. Transfer tissues in polypropylene tubes. Clear tissues in methylsalicylate (handle under chemical hood) 18 or as an alternative use BABB solution 19. Incubate at RT under constant agitation until the tissues become transparent. Mount between a slide and a coverslip sealed with hard set mounting medium (Figure 1C, upper panel). Image samples on an inverted confocal microscope equipped with high NA 63X and/or 100X oil immersion objectives (Figure 1C). Clean the lens with cleaning solution provided by the microscope manufacturer. Apply one drop of the oil on the objective lens. Place the slide with the specimen on the microscope stage and focus on the sample. Set the configurations on the microscope for simultaneous imaging of three-channel fluorescence with laser lines 488 nm, 514 nm and 633 nm. Acquire single XY images or multiple focal plane images (Z stack) (Figure 3A). Use increased width of Z stack for performing 3D reconstruction. To obtain a high-resolution image use low scanning speed, number of average scans (≥ 3) and acquire 16-bit images of 1,024 x 1,024 pixel resolution. Analyze the Z stack acquired images: first rename and save image file (xyz). Using the software program of the confocal microscope, configure a maximum intensity projection of the Z stack images into a 3D reconstructed image. Select the xyz file, in the “Process Tools”, click under “Visualisation” and “3D Projection”. Enter “Maximum” in the method of projection (or “Average” if the fluorescent signal is saturated). For a single projection do not change the X, Y, and Z planes, and apply the projection tool (Figure 3B, r1). Use the Z stack images to create a 3D projection with animation (confocal software) for viewing purposes. Select the xyz file, in the Process Tools, click under “Visualisation” and “3D Projection”. Click on “Create Movie”. Enter the Start Rotation angle in degrees (e.g., 0° as starting point of the movie, Y axis) and click on “Set Start”. Enter the End Rotation angle in degrees (Y axis) as end point of the movie (e.g., 180° or 360° for a complete rotation) and click on “Set End”. Select “Maximum” as a method of projection (or “Average” if the fluorescent signal is saturated). Enter the ”Number of Frames” for the rotation of the 3D reconstruction (e.g., 20 rotations or higher to reduce the speed of rotation). Click on “Apply”. Export the movie as visual file (e.g., “avi”) (Supplementary Movie 1) or export as “tiff” file which creates an image file for each rotation angle (Figure 3B; rotation r4, r10, r18). Remove transwell plates from incubator and place a single (unfixed) tissue part in a 35 mm cell culture plate containing 500 µl of medium. Position the tissue so that the long axis is flat on the plate. Keep tissue wet at all times however, not floating. Place water-immersed objective of the multiphoton microscope directly in contact with the tissue (Figure 1C). Obtain images with an excitation wavelength of 800 nm and collect emitted light between 371-425 nm (SHG, collagen) and 474-532 nm (autofluorescence, elastin) (Figure 3C). Perform two-photon microscopy in an upright confocal microscope equipped with a femtosecond laser using a 20X/1.0 NA water-immersion objective. Process confocal stacks with manufacturer’s software. Note: Excitation with a near infrared laser of collagen molecules creates high contrast imaging of native collagen structures in different depths. The method of ex vivo, 3D culture of connective tissue is an easy and robust set up system to understand the relation between ECM and other cell components constituting the DD tissue and potentially other types of fibrosis as well. Moreover this system allows a reliable method to test the effects of compounds on different cell types and their effects on the fibrotic load 20. The steps from collection of surgical waste material derived from Dupuytren’s fibrosis, the assembly of the culture chamber and examples of analysis tools are presented in Figure 1. As illustrated in Figure 1, this method provides an experimental tool for large screens drug screens, e.g., antifibrotic drug compounds as well as the study of ECM modelling in a real-time and reproducible manner. Nodular parts of the fibrotic cord are equally sliced and placed in transwell plates; each tissue part (100-200 µm) is cultured on top of the membrane of a culture insert (0.45 µm pore size, 12 mm diameter). Culture medium is added at the bottom chamber, allowing contact with the tissue through the membrane. On average 30-40 tissue parts can be derived from a single resection specimen, which allows large-scale screening of drugs; compounds, small molecules or growth factors. Experiments addressing the concentration and/or time-dependent effect of drugs are feasible. As shown in Figure 2, gene expression can be manipulated (overexpression/knock down) by the use of adeno/lentiviruses directly injected into the tissue. Fluorescently tagged viral transduction is performed in fresh thick tissue specimens by injection. Tissue remains in culture for 24-48 hr post-injection and is subsequently fixed, embedded and sectioned in 0.7 µm cryosections. Moreover, to analyze the effect of different compounds or culture conditions the tissue parts are fixed and subjected to whole mount immunofluorescence as shown in Figure 3. 3D imaging of thick tissues is done by confocal microscopy (Figure 3A-B). 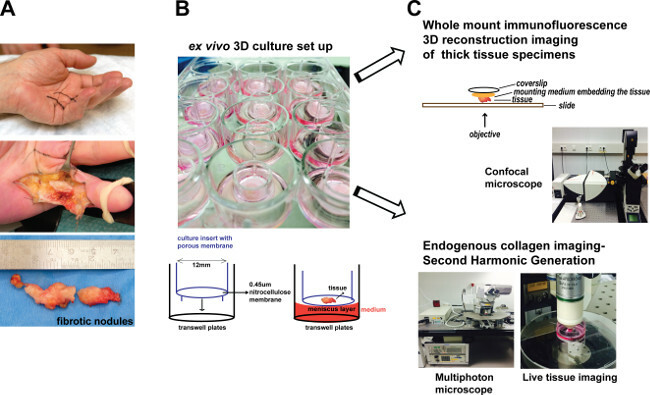 Another method is the live 3D imaging on tissues maintained in culture; endogenous collagen remodeling is studied real-time in freshly dissected, non-fixed tissue parts by second harmonic generation (SHG) (Figure 3C). The effect of potential anti-fibrotic drugs is also followed in parts of the same tissue at different time points. Collagen structures of thick tissue are imaged using SHG in an upright multiphoton microscope. During imaging, tissue specimens are placed in medium and are imaged with a water-immersion objective. After imaging, the tissues can be transferred back to the culture system. Effects can be studied at the level of cellular and extracellular environment providing an advantage over in vitro cell-based assays. There are multiple possibilities for analysis of biological effects such as histology of fixed tissue sections, whole mount immunofluorescence and 3D reconstruction imaging by confocal microscopy, SHG and two-photon excited fluorescence imaging of endogenous collagen and elastin. Some of the advantages of the SHG imaging are the use of fresh, non-fixed tissue, that no antibody staining preparation is required and that the same tissue can be imaged multiple times (time course during culture conditions). SHG and two-photon excited fluorescence imaging has been described previously for muscle and connective tissue 21-23 and unstained arterial wall structure 24, however, here we report an alternative application for the study of Dupuytren’s fibrosis. Figure 1. Scheme of ex vivo 3D tissue culture system. (A) DD permanent flexion contracture in the hand of a patient prior to surgical removal. This figure has been modified from previous study 5. (B) Example of ex vivo culture set up. (C) Examples of experimental approaches that can be used for analysis of ECM deposition. Please click here to view a larger version of the figure. Figure 2. Proof-of-principle ex vivo viral-mediated gene expression modulation in whole mount tissue. (A) Nuclei are visualized with TO-PRO-3 dye (blue). Bars 75 µm. (B) Direct visualization of the fluorescent dye DsRed (red), post-injection with Adenovirus expressing-DsRed. Bars 75 µm. (C) Merged image (nuclear staining in blue, DsRed in red). Cytoplasmic localization of DsRed indicating adenoviral delivery in the cells within 24 hr. Bars 75 µm. (D-F) Lentiviral transduction. (D) Nuclei are visualized with TO-PRO-3 dye (blue). Bars 25 µm. (E) Direct visualization of GFP in tissue sections (green), post-injection with lenti-GFP particles. Bars 25 µm. (F) Merged image of D and E indicating intracellular localization of lenti-GFP. Bars 25 µm. (G-H) Example of lentivirus-mediated knockdown against gene of interest (designated as “A”); (G) Lentivirus carrying scrambled shRNA sequence was injected ex vivo into the tissue. Immunofluorescence staining for protein of interest (designated as “A”) shown in red. Bars 75 µm. (H) Lentivirus carrying gene A-shRNA sequence was injected ex vivo into the tissue. Immunofluorescence staining for protein “A”. Nuclei are stained with TO-PRO-3 dye. Bars 75 µm. Please click here to view a larger version of this figure. Figure 3. 3D reconstruction imaging, second harmonic generation and two-photon excited fluorescence imaging. (A) 3D imaging by confocal microscopy. Single (xy) images in focal planes along different tissue depths (z = 50-200 µm). Whole mount immunofluorescence staining; myofibroblast marker α-smooth muscle actin (αSMA, red), nuclear staining (TO-PRO-3, blue). Bars: 500 µm. (B) 3D reconstructed image (Z stack 389 µm) of raw images as indicated in panel A at different 3D rotations indicated as “r1”, “r4”, “r10”, “r18”. Bars 500 µm. (C) Endogenous collagen content modeling by second harmonic generation (SHG) imaging in fresh, thick tissue parts (left panel, green). Two-photon excited fluorescence (TPF) of elastin structures of the ECM was captured by multiphoton microscopy (middle panel, red). Merged image of collagen (green) and elastin (red) (right panel). Bars: 100 µm.Please click here to view a larger version of this figure. Supplementary Movie 1. Representative 3D reconstruction movie of Dupuytren’s whole mount tissue. Confocal imaging of DD tissue was performed after seven-day ex vivo culture and processing for whole mount immunofluorescence staining; myofibroblast marker α-smooth muscle actin (αSMA, red), nuclear staining (TO-PRO-3, blue). Scale bar = 500 µm. Frames= 20. Z= 389 µm. Please click here to view this video. 4% paraformaldehyde / PBS Dissolve 4 g of paraformaldehyde in a flask containing 100 ml Phosphate Buffered Saline (PBS) in the fume hood, cover the flask. Place the flask on a heating/stirring block and gently stir the solution. Monitor the temperature so that is reaches a maximum 65 °C. Avoid over-heating. Once the paraformaldehyde has dissolved and the solution appears clear, switch off the heat but leave to stir. Do not handle for safety reasons. Allow cooling. When cooled, aliquot the solution and store long term in -20 °C freezer or in a 4 °C refrigerator for maximum a week. BSA (bovine serum albumin), 10% (w/v) Dissolve 10 g BSA in 100 ml H2O. Filter sterilize using a low-protein binding 0.22-µm filter. Store at 4 °C. DMSO/Methanol (20%) permeabilization solution Mix Dimethyl Sulfoxide with Methanol (1:4 analogies, total volume 100 ml). The most critical steps of culturing ex vivo human connective tissue are the immediate use of the tissue after surgical removal to ensure viability; the tissue should remain in medium or saline solution at all times; maintain a sterile culture; transverse sections of tissue should have maximum 200 µm thickness; set up of the ex vivo culture system is optimal when tissue is in contact with the medium but not fully submerged. Medium should be added only on the outside chamber of the transwell in a small volume (e.g., 500-600 µl per 12-well plate surface area). Connective tissue derived from Dupuytren’s is entangled in a tough structure with high content of ECM proteins such as collagen, proteoglycans, and elastin; due to these properties and additionally due to myofibroblast contracture it can be challenging to cut through the tissue. It is important to use appropriate surgical tools; curved bladed Mayo scissors for cutting larger parts in equal thickness and smaller surgical scissors for cutting smaller tissue parts (e.g., if more tissue parts are required use 24-well plates). Methods for the study of DD are histopathological analyses of the excised fibrotic specimen, or derivation of primary fibroblasts. Cell derivation from the patient material is done is two ways; in one of the methods, tissue parts are cultured in plastic culture plates for a number of weeks until there is outgrowth of fibroblasts. The second method is enzymatic treatment of tissue with collagenase and trypsin. The first method is time consuming, fibroblast properties are altered due to culture conditions and there is passage-dependent variability among passages of the same cell line. The enzymatic method is faster and it can be used for cell sorting assays, however, in vitro maintenance of these cells out of the innate ECM does not reflect the in vivo properties. The model presented here is suitable for cell and ECM morphology studies and several techniques have been successfully utilized such as immunofluorescence, flow cytometry, RNA analyses, whole mount 3D imaging, and collagen deposition measurements (secreted in the culture media). However, total protein isolation from the tissue parts, cell signaling experiments and protein immunoblotting require optimization and are not as robust as the monolayer fibroblast cultures. Another drawback of the method is lack of mechanical tension engineered to the culture system. Most connective tissues exist under a constant or basal mechanical force, even during resting conditions, which not only provides mechanical support but also influences cell behavior and signaling 25 (namely mechanoregulation and mechanotransduction). Loss of tension results in disassembly of αSMA fibers in MFBs in short period of time 26. The abundance of αSMA in the ex vivo cultured tissues indicates MFB contractility. Nevertheless, our model could benefit from incorporation of an isometric force transducer 27, 28. Regarding technical and biological variability, our method is reproducible (viability, ECM network) and less prone to tissue alteration due to short time of culture. For instance, the method of fibroblast outgrowth requires several weeks which may cause biochemical changes (e.g., accumulation of genetic mutations, replicative senescence). However, patient-specific genetic characteristics and biological variability are per se challenges in the DD research field and cannot be tackled with any of the current methods. As shown in this protocol, fibrotic DD specimens after surgical removal are directly cultured in the ex vivo 3D system and/or snap frozen. Depending on the scientific question, modification of the tissue is possible by addition of growth factors, chemical compounds, virus-mediated gene delivery, antisense oligonucleotides and miRNAs. Compounds can be delivered in the media or with local microinjections of the tissue in the 3D culture chamber. After 3 and up to 7 days of culture the tissue can either be homogenized for cell isolation and FACS analysis or isolation of total RNA and proteins for expression profile analysis, as well as processed for histological analysis. The expression status of fibrous proteins (αSMA, collagen type I and II, fibronectin), tissue architecture of the nodule part of the cord and the consistency of the fibrous network is assessed before and after the treatments. In order to monitor the ECM rearrangements during the culture we combined the SHG (collagen) and two-photon excited fluorescence (elastin) imaging. The extracellular rearrangements can then be quantified or modeled using image quantification software. These parameters give an indication of the drug effects on fibrosis or the molecular alterations that have been induced during the culture. Moreover ECM arrays can also be performed on single slices to generate a better overview of the effects. Overall we have established a robust system that allows the study of fibrosis ex vivo. The authors have filed a Patent Application for Dupuytren’s disease: 3D organ culture. # GB1307200. Commercial license and service contracts are available. The authors are thankful to the nurses at the AMC that have facilitated the tissue collection. We would also like to acknowledge A.M.A. van der Laan for excellent technical support with the SHG and the two-photon imaging. Zeiss 710 NLO upright confocal microscope Jena, Germany Equipped with femtosecond Spectra - Physics Deep See MP laser (Santa Clara, United States) using a Plan-Apochromat 20X/1.0 NA water-immersion objective. Shih, B., Bayat, A. Scientific understanding and clinical management of Dupuytren disease. Nat Rev Rheumatol. 6, (12), 715-726 (2010). Bisson, M. A., McGrouther, D. A., Mudera, V., Grobbelaar, A. O. The different characteristics of Dupuytren's disease fibroblasts derived from either nodule or cord: expression of α-smooth muscle actin and the response to stimulation by TGF-β1. The Journal of Hand Surgery. 28, (4), 351-356 (2003). Brickley-Parsons, D., Glimcher, M. J., Smith, R. J., Albin, R., Adams, J. P. Biochemical changes in the collagen of the palmar fascia in patients with Dupuytren's disease. The Journal of Bone & Joint Surgery. 63, (5), 787-797 (1981). Berndt, A., Kosmehl, H., Katenkamp, D., Tauchmann, V. Appearance of the myofibroblastic phenotype in Dupuytren's disease is associated with a fibronectin, laminin, collagen type IV and tenascin extracellular matrix. Pathobiology. 62, (2), 55-58 (1994). Karkampouna, S., et al. Novel ex vivo culture method for the study of Dupuytren's disease: effects of TGFβ type 1 receptor modulation by antisense oligonucleotides. Mol Ther Nucleic Acids. 3, e142 (2014). Kruithof-de Julio, M., et al. Canonical Wnt signaling regulates Nkx3.1 expression and luminal epithelial differentiation during prostate organogenesis. Developmental Dynamics. 242, (10), 1160-1171 (2013). Krause, C., Kloen, P., ten Dijke, P. Elevated transforming growth factor β and mitogen-activated protein kinase pathways mediate fibrotic traits of Dupuytren's disease fibroblasts. Fibrogenesis & Tissue Repair. 4, (1), 14 (2011). Gorman, D. B., Wu, Y., Seney, S., Zhu, R. D., Gan, B. S. Wnt expression is not correlated with beta-catenin dysregulation in Dupuytren's Disease. J Negat Results Biomed. 5, 13 (2006). Streuli, C. H., Schmidhauser, C., Kobrin, M., Bissell, M. J., Derynck, R. Extracellular matrix regulates expression of the TGF-beta 1 gene. The Journal of Cell Biology. 120, (1), 253-260 (1993). Vogel, V., Sheetz, M. Local force and geometry sensing regulate cell functions. Nat Rev Mol Cell Biol. 7, (4), 265-275 (2006). Gottrup, F., Ågren, M. S., Karlsmark, T. Models for use in wound healing research: A survey focusing on in vitro and in vivo adult soft tissue. Wound Repair and Regeneration. 8, (2), 83-96 (2000). Gudjonsson, T., et al. Normal and tumor-derived myoepithelial cells differ in their ability to interact with luminal breast epithelial cells for polarity and basement membrane deposition. Journal of Cell Science. 115, (1), 39-50 (2002). Xu, R., Boudreau, A., Bissell, M. Tissue architecture and function: dynamic reciprocity via extra- and intra-cellular matrices. Cancer and Metastasis Reviews. 28, (1-2), 167-176 (2009). Jokinen, J., et al. Integrin-mediated cell adhesion to type I collagen fibrils. Journal of Biological Chemistry. 279, (30), 31956-31963 (2004). Au-Yong, I. T. H., Wildin, C. J., Dias, J. J., Page, R. E. A review of common practice in Dupuytren surgery. Techniques in Hand & Upper Extremity Surgery. 9, (4), 178-187 (2005). Deries, M., Collins, J. J. P., Duxson, M. J. The mammalian myotome: a muscle with no innervation. Evolution & Development. 10, (6), 746-755 (2008). Deries, M., et al. Extracellular matrix remodeling accompanies axial muscle development and morphogenesis in the mouse. Developmental Dynamics. 241, (2), 350-364 (2012). Martins, G. G., et al. Dynamic 3D Cell Rearrangements Guided by a Fibronectin Matrix Underlie Somitogenesis. PLoS ONE. 4, (10), e7429 (2009). Yokomizo, T., et al. Whole-mount three-dimensional imaging of internally localized immunostained cells within mouse embryos. Nat. Protocols. 7, (3), 421-431 (2012). Karkampouna, S., de Julio, M. K. ruithof- Fibrosis: a novel approach for an old problem. Receptors & Clinical Investigation. 1, (5), (2014). Wolf, K., et al. Collagen-based cell migration models in vitro and in vivo. Seminars in Cell & Developmental Biology. 20, (8), 931-941 (2009). Freund, I., Deutsch, M., Sprecher, A. Connective tissue polarity. Optical second-harmonic microscopy, crossed-beam summation, and small-angle scattering in rat-tail tendon. Biophysical Journal. 50, (4), 693-712 (1986). Mohler, W., Millard, A. C., Campagnola, P. J. Second harmonic generation imaging of endogenous structural proteins. Methods. 29, (1), 97-109 (2003). Boulesteix, T., et al. Micrometer scale ex vivo multiphoton imaging of unstained arterial wall structure. Cytometry Part A. 69A, (1), 20-26 (2006). Tomasek, J. J., Gabbiani, G., Hinz, B., Chaponnier, C., Brown, R. A. Myofibroblasts and mechano-regulation of connective tissue remodelling. Nat Rev Mol Cell Biol. 3, (5), 349-363 (2002). Hinz, B., Mastrangelo, D., Iselin, C. E., Chaponnier, C., Gabbiani, G. Mechanical tension controls granulation tissue contractile activity and myofibroblast differentiation. The American Journal of Pathology. 159, (3), 1009-1020 (2001). Eastwood, M., McGrouther, D. A., Brown, R. A. A culture force monitor for measurement of contraction forces generated in human dermal fibroblast cultures: evidence for cell-matrix mechanical signalling. Biochimica et Biophysica Acta (BBA) - General Subjects. 1201, (2), 186-192 (1994). Verjee, L. S., Midwood, K., Davidson, D., Eastwood, M., Nanchahal, J. Post-transcriptional regulation of α-smooth muscle actin determines the contractile phenotype of Dupuytren's nodular cells. Journal of Cellular Physiology. 224, (3), 681-690 (2010).